I forgot about my hunger when I got off the taxi in front of my hotel in Hoi An. I was excited to be in a new place, and after checking in and dumping my things into my room, I was out in the streets, eager to explore. 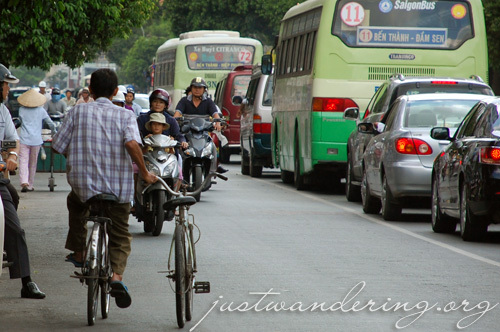 I turned left in a crucial intersection, towards the opposite direction of Hoi An’s old quater. There was nary a tailor in sight, just houses and shops catering to the local’s needs. She was standing on the curb, about to ride her scooter, when she called out to me in English. “I saw you on the other street,” she said. “You’re in the wrong part of town. Did you just arrive in Hoi An?” I was never the type to start a conversation when I travel, so to have someone engage me in conversation can be a treat, specially after traveling solo for a couple of days. I was just to ecstatic to be talking to somebody that even when the word “tailoring shop” was thrown into the conversation, I shrugged it off, and instead hopped into the back of the scooter when she offered to take me to the Central Market, where her shop was. As we were riding through town, I recalled a similar ride in Ko Phangan, Thailand. The lady at the travel agent offered to take me with her when she went to eat lunch. I don’t know how to ride a bike and that was my first time to ride a motorcycle. She took me to this place where the locals eat, and though I can’t remember what we had, I remembered I was so grateful for her generosity and hospitality. This encounter was different though. My new friend’s charming demeanor slowly melted when we got to the market. She was getting a bit impatient while I was eating my late lunch at her friend’s stall, and when we got to her sister’s shop, it has completely vanished. She wasn’t rude, you just can’t help but feel so used, specially since after going through the tailor’s catalogs and materials, she was pushing me to her friend who makes custom shoes, and even to an old lady who was doing mani & pedi. I had another similar encounter in Hue, but not as bad as that encounter in Hoi An. I was making my way to the Citadel, and came upon this bridge. There was a no entry sign and most of the traffic were going in the opposite direction. I stop to ask a shopkeeper if I can go through this bridge and she said yes. Before I can leave she invites me to sit down under the tree for some drinks. The sun was pretty high up, so I figured I’d take her up on her offer and wait until it’s a little cooler before proceeding. Like the lady in Hoi An, she was very curt when I paid for my drink. As I recounted these encounters to Carlo, a reader who’s been to Vietnam before, he describes the Vietnamese as very enterprising. I, on the other hand, would describe them as very good sales people who lack after sales service. But this is not to say that the Vietnamese are just after your money nor do they fail in customer service. I had more positive encounters in Vietnam, except that it’s the negative experiences that you remember sometimes. On my first day in HCMC, the guesthouse staff gave me a dragon fruit, mainly because they have some (their standard breakfast is a baguette and a banana, so this is a treat). She even opened it for me, because I was just staring at the fruit, figuring out how to eat it. The guesthouse staff in Hanoi were also very nice. They were all so attentive, specially Ms. Chau who was treat everyone like they’re a part of her own family. Of course, there might be some biases there, since these were service people. Luckily, I got to chat with some Vietnamese who weren’t in the payroll of any hostels I’ve stayed in or were in any way getting money from me, and they were genuinely nice. There was the couple who was in the same tour as I was in Hue. They were on a holiday, and we were soon chatting about nice places to see around Vietnam as we sit along the banks of the Perfume river. There was also the Vietnamese family who shared their baon (packed lunch) with me and another foreigner during our lunch on board the boat. The most memorable though was the businessman who was on the same overnight bus to Hanoi. We were waiting at the bus company’s office in Hue and as soon as a bus rolled to the curb, the people at the office swarmed towards it. As the staff inside the office were suddenly busy, I asked him if this was the bus to Hanoi. He said yes, but we would be getting on the second bus. The bus had some empty seats, so the staff told some of us remaining passengers that we can hop on board. After two hours of mad honking and swerving, the bus pulled up to a small restaurant. As the local passengers took seats, I spot the businessman and asked if this stop was for dinner. He said yes, and as the restaurant was filling up, I asked if I can share the table. There the usual small chit-chat, but the dinner progressed in comfortable silence. I realize there’s really nothing noteworthy with this particular encounter, but it just shows that even when the Vietnamese can be very aggressive when they’re trying to sell you something, you don’t have to be wary all the time when you’re in the country because there are those who will show you kindness and flash a genuine smile. This is my entry for the Blogsherpa Blog Carnival. This round, Encounters, is hosted by Camden Luxeford of The Brink of Something Else. The Blogsherpa is a project of Lonely Planet that displays bloggers posts about destinations or interests on lonelyplanet.com. Read the other entries here. oh lol this reminds me of the time a group of con artists tried to take us for the old tuktuk-and-gems scam. we came across them on a busy street corner while holding a map — that was probably our biggest mistake. so anyway, they said that tuktuk rides were discounted on that day from 150 THB to 10 THB for a tour which would culminate in a quick stop at a gem store. we knew something was up at the mention of the word “gems” but we decided to go along for as long as it was still okay with us. we went to about three temples where other locals tried to chat us up when we finally ended up at the gem store — and the store owners didn’t went to let us in because we looked like locals with no cash! on top of that, the tuktuk driver left in disgust — without getting paid! haha. wow! what an honor to be mentioned in your blog. (this is me right?) haha. thanks for being diplomatic. i think my exact words were “makulit”. beware in ben thanh market, the ladies will poke you on the shoulder for you to visit their stall. argh. yeah i notice in vietnam, they’re very competitive. they really don’t take no for an answer. plus, they understand when you say “mahal” they’ll counter “no, not mahal!” can’t help but compare with the really nice cambodians. oh well. wish us luck. we’re off to saigon and hoi an this weekend. i’ll stay clear of friendly folk offering a ride on a scooter haha. hope to meet nice vietnamese people on this trip. very nice write up! I love the way you write I haven’t had any bad experiences so far but I remember my finacé saying that he was corned into a rug shop twice while he was in India! It was pretty scary daw and I am very thankful that nothing bad happened to him. Whoops sorry I almost missed you Nina! Great post, adding it in now. Even experiences that are annoying then and there, become great stories afterwards. Besides, travelling would be a bit boring if everything went smoothly and everyone were nice all the time, no? oh yeah forgot to mention: if vigan and siem reap had a child, it would be hoi an :-) glad we made this trip to central vietnam. just hated jetstar pacific’s 2.5 hour delay on the flight to danang. i actually appreciated cebu pacific’s much improved reliability. haha. The Turks are sometimes like that as well. I think if it was my first visit and I was traveling solo then it would put me off, but from the sounds of it, you were able to take it on the chin. Hello Miss Nina, i really love your site. I wanna ask some tips, i know u been to Vietnam before kasi me and foreigner boyfriend plan to visit vietnam and ako lang mag travel pupunta doon mag isa at mauna lang sya a day before bale sunduin na lang ako sa Ho chi min airport..i want to ask bilang isang membro ng “bilateral” member country sa asia at free visa.. ang tanung ko maliban sa free visa meron pa bang kelangan na e process bago pumunta doon kasi sa dinig ko meron pang necessary to fill up some form at Vietnam embassy in manila prior to my flight. thank Nina and more power!!! Thank you so much for this, i will be leaving first week of May kaya ako nagtatanong tanong, salamat ulit sayo. Be a part of the Seair and Microtel Boracay Blogger’s tour!